So when I looked through you side about slow water coming in (cold) to my washer you suggested I clean them, which I did. It worked for a little while and now its back to slow. I checked the water valves and the screens and they are clean. What should I do next? Just give up and buy new ones? Hi Jacob, if the screens are clear then it sounds like you need to replace the water inlet valve 285805. I hope this helps! Little or no hot water into machine, cold is ok. Screens in hose is clean. Hello Paul, If you've checked the screens, and if the inlet hoses are not kinked or obstructed you will might have an issue with your water inlet valve circuit. This valve has two solenoids that operate inlets for both the hot and cold water. You can test solenoids for continuity with a multi-meter. If the solenoid has no continuity is faulty. These solenoids are normally not available separately so you will need to replace the complete valve. Make sure you shut off the power or unplug the appliance before performing this test. I hope this helps! Hi Tom, Thank you for the question.If you've checked the screens, and if the inlet hoses are not kinked or obstructed you will might have an issue with your water inlet valve circuit. This valve has two solenoids that operate inlets for both the hot and cold water. You can test solenoids for continuity with a multi-meter. If the solenoid has no continuity is faulty. These solenoids are normally not available separately so you will need to replace the complete valve. Make sure you shut off the power or unplug the appliance before performing this test. I hope this helps! I turned my washer on today and everything seemed normal and I walked away but when I came back I noticed it is not filling up with water (cold), what should I check for first? Hi Harper, we suggest checking the valve that allows the cold water into your washer. It could be at fault and not staying open to allow the washer to fill properly. Please let us know if you have any further questions! Does this part fit Whirlpool washer model # ghw9400pt0? Hi Terry, Thank you for your inquiry. 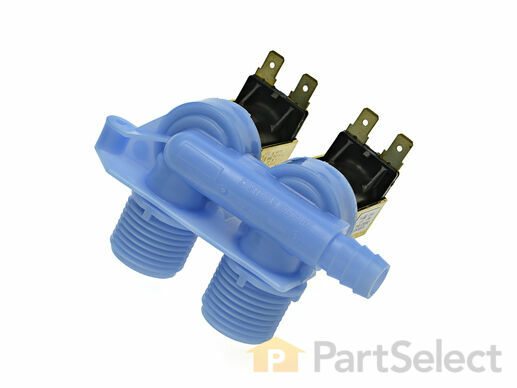 The part number for the correct water inlet valve for your appliance is PS11744913. I hope this helps. Thank you and have a great day! My washer is taking FOREVER to fill up!! Neighbor said to check and clean the water valves but how would I go about doing that? I know where to find them but I’m not exactly sure what to do with them??? Hello Ashely, you need to remove the hose that is attached to the faucet and the valve, and then you can access the screens to push them out. we suggest soaking them in hot water with a splash of white vinegar to give them an all over clean. Best of luck with this repair! My washer fills will water at the beginning of the wash cycle. It then washes the clothes and drains the water, but it will not fill with water again. It then continues to agitate without any water. It will also stop after the water is drained and I have to manually start the washer to fill it up with water again. What do I need to replace? Hello Amanda, Thanks for your question. Check the pressure tube that connects from the water level control to the tub. It may be obstructed and should be cleaned. You may also want to test the water inlet valve with a multi-meter to ensure it has continuity, and replace it if it does not show continuity. If those parts are intact, consider replacing the timer. I hope this helps. I have Kenmore top loading washing machine. When you turn it on, the water comes on and fills the tub, but does not shut off when its full and it keeps flooding the room. What is my problem? Hello Lottie, Thank you for your inquiry. We would recommend checking the following parts to fix your issue: water inlet valve, water level switch kit with pressure hose, hose clamp, and the water pump. You can test the parts with a multimeter. If you are unfamiliar with how a multimeter functions, there are YouTube videos available to assist you. Hope this helps! Our washing machine has a persistent slow drip into the tub from the top when washing machine is not in operation. I assume this would indicate the need to replace the fill valve? Hello Mike, Thank you for your inquiry. I would also check the washers and hoses as well. Hope this helps! Hi Randy, thank you for your question. Yes, this is the correct water inlet valve for your appliance. I hope that helps. Good luck with your repair. The part came so fast I did not get a week off from doing the laundry. Tried to hide the part but my wife found it after checking the shipping status. the exact part i needed and the video made it easy to install. saved a small fortune. The part I needed came so quickly. The online video really helped make the installation a breeze! I'm so glad I found this site. The part wasn't for my model but because of the price I decided to give it a try. It fit right in. Now, the washer is back to form. Fast shipping. Part was a perfect match. Washing machine is up and running again. I watched a youtube on this. I knew what part I needed, ordered it, very inexpensive, and the ordering process and staff was great. I replaced the valve, quite an easy task. Now our washer works like new. Wow! Thank you very much. I ordered this part for my elderly parents' washing machine when the rinse cycle stopped working. It only required one screw, three hose connections, and two electronic plugs. Literally 5 minutes to replace. The delivery was fast too. Thanks guys!